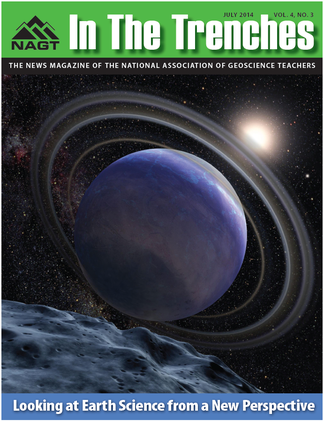 Planetary science education in US classrooms is rooted in the National Aeronautics and Space Act of 1958. This espoused three main goals, including one that provided a clear directive for education: The Administration, in order to carry out the purpose of this Act, shall (1) plan, direct, and conduct aeronautical and space activities; (2) arrange for participation by the scientific community in planning scientific measurements and observations to be made through use of aeronautical and space vehicles, and conduct or arrange for the conduct of such measurements and observations; (3) provide for the widest practicable and appropriate dissemination of information concerning its activities and the results thereof. Whatever topic you teach in the Earth sciences, you likely have come across a news article, a colleague's research, or a textbook example of how the basic concepts you cover are also necessary for understanding a planet besides Earth. Those descriptions are not only exciting for students to hear about in introductory science classrooms, but they also give them to opportunity to think outside the box (or the planet, in this case!). Importantly, understanding geologic processes on other planetary surfaces requires students to use higher-order thinking skills and apply their terrestrial knowledge to an exotic and strange scenario. A growing body of evidence confirms that participation in an authentic research experience is a powerful, transformative educational experience for undergraduates. Given the potential impact of experiences like this, the educational community must strive to implement projects which provide them. But what is the best way to do that? How can undergraduates in an introductory Earth or planetary science course better utilize free, online, NASA Mars data and imagery? Using Earth-based analogs, the NASA-sponsored Mars for Earthlings (M4E) program offers those interested in including planetary content in their introductory-level courses, a college curriculum resource package that connects undergraduates with data and imagery as a means of encouraging and increasing student enrollment in STEM courses and broadening knowledge of NASA missions. Nuggets of wisdom from participants in the 2014 Cutting Edge Workshop for Early Career Geoscience Faculty, held June 22-26 at the University of Maryland. This site contains a variety of resources for faculty members who wish to integrate examples from Mars into a variety of undergraduate courses such as sedimentology, petrology, and hydrology. Mars for Earthlings seeks to expose undergraduate students to planetary study through Mars remote sensing data and Earth-based analogs. Through this resource instructors/educators/professors can access learning modules to integrate into earth science classes. Interviews and thoughts from planetary scientists and geologists will present current issues in planetary sciences. Engaging students in using data to address scientific questions has long been an integral aspect of science education. Today's information technology provides many new mechanisms for collecting, manipulating, and aggregating data. In addition, large on-line data repositories provide the opportunity for totally new kinds of student experiences. This site provides information and discussion for educators and resource developers interested in effective teaching methods and pedagogical approaches for using data in the classroom.